Oakland labor lawyer David Rosenfeld left no doubt Friday where he stands on the anti-union California ballot measure known as Proposition 32. 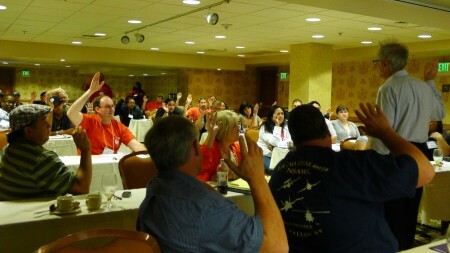 During the CWA’s annual District 9 Northern California-Nevada stewards conference in Reno, Rosenfeld had the participants raise their right hands and “swear or affirm” to talk against, organize against, phone-bank against and wear buttons against the odious proposition, designed to restrict union political power while leaving a clear field for corporate-backed Super PACs. The stewards conference continues Saturday with a seminar by the Media Workers Guild on labor and the press.